We are constantly being asked if we have printables that volunteers can print off and help distribute. These are some of our files that are available electronically. Please keep in mind that the color of paper MUST be white for printing, and that there are to be no manipulations of logos, color schemes, wording, etc. These documents are copyrighted to the Society. We also ask that you use common courtesy and discretion when placing any of these materials. Please ask before leaving brochures anywhere or placing posters up. These materials are not to be used for agressive advocacy means, but rather, as informed educational materials. This is a full color brochure that prints double-sided onto a 8.5" X 11" sheet of paper. The set up for this is full-bleed with fold marks indicated. Click here for the Society Brochure file. This brochure is informational for the general public. It explains in detail about Lyme disease and what you can expect in Canada today when looking for treatment. The brochure is black and white, double sided with full bleeds. It prints on an 8.5" X 11" sheet of paper. Click here for the What is Lyme? Brochure file. 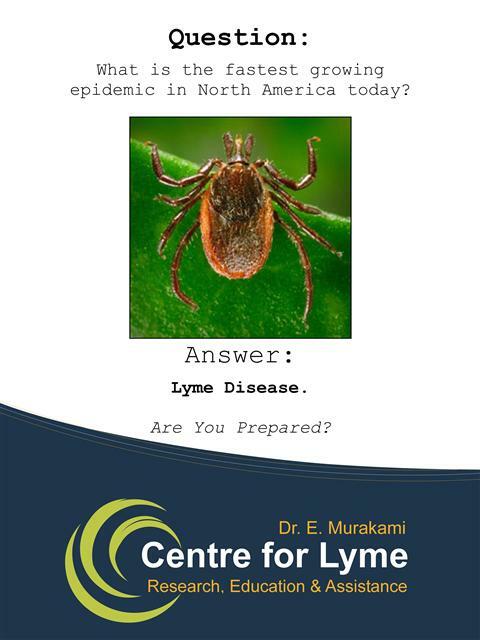 The insert is meant to accompany the What is Lyme? Brochure when being distributed to provinces in which Family Physicians can order and prescribe Intra Venous Antibiotic Therapy. The brochure on its own reflects the present laws in BC and other provinces where this method of therapy must be ordered by an Infectious Disease Specialist. This double-sided large mail-out brochure is full color on 11 X 17" paper. Full bleeds and fold lines indicated. It is informational and educational in that it shows both sides of the Lyme controversy, enabling the Physician to come to a conclusion about proper diagnosis and treatment of the Lyme patient. Click here for the Interpreting Lyme for Physician's file. This poster was designed for Lyme awareness. It poses the question "What is the fastest growing epidemic in North America Today?" followed by the answer, "Lyme Disease. Are you prepared?" Prints in full color on 8.5" X 11" paper. Click here for the Question poster file. Another Lyme awareness poster, but this one outlines the common struggles with finding a doctor who can properly diagnose the disease. Full color, prints on 8.5" X 11" paper. Click here for the You Are Not Alone poster file. This is a full color four-page article that can be printed double-sided onto 8.5" X 11" paper. 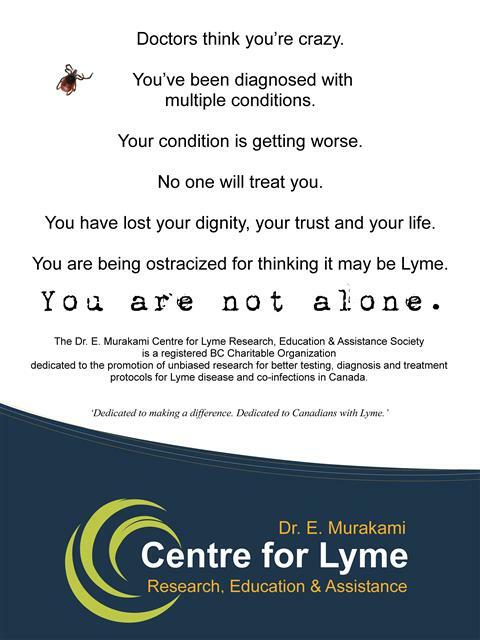 It was originally written by Dr. Murakami for the First Canadian Healthcare Conference in 2009, and presents compelling evidence that Lyme has a stronger foothold in Canada than most people are willing to believe. 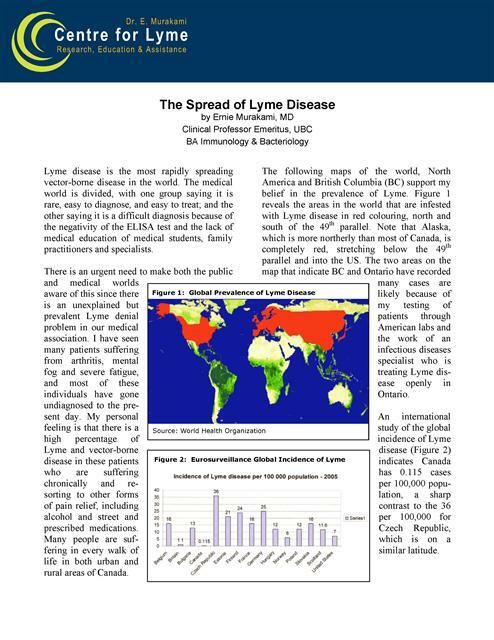 Click here for the Spread of Lyme Disease Article file.